I wanted to talk to a local business owner about our worker-owned cooperative cafe idea, and I contacted Maura McAuliffe. 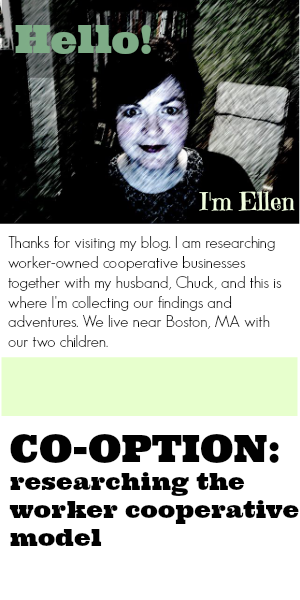 She and her husband own two local restaurants and a coffee shop, The Mad Raven in Waltham, The Raven’s Nest and The Coffee Perch in Walpole. 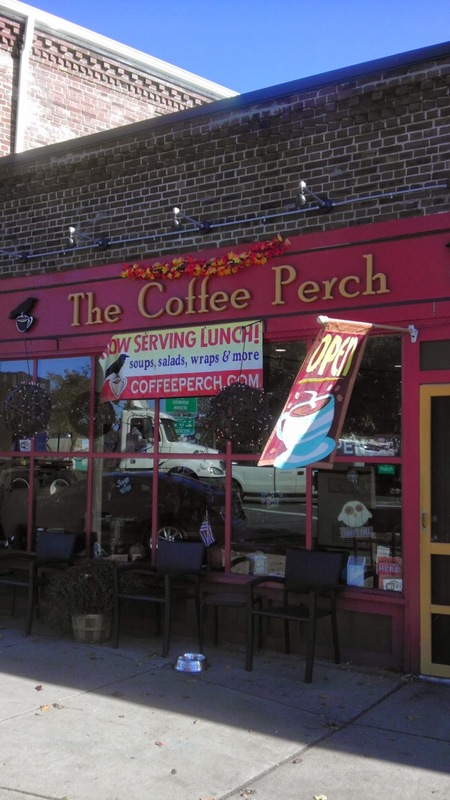 I met with Maura at The Coffee Perch on a sunny weekday morning in November. 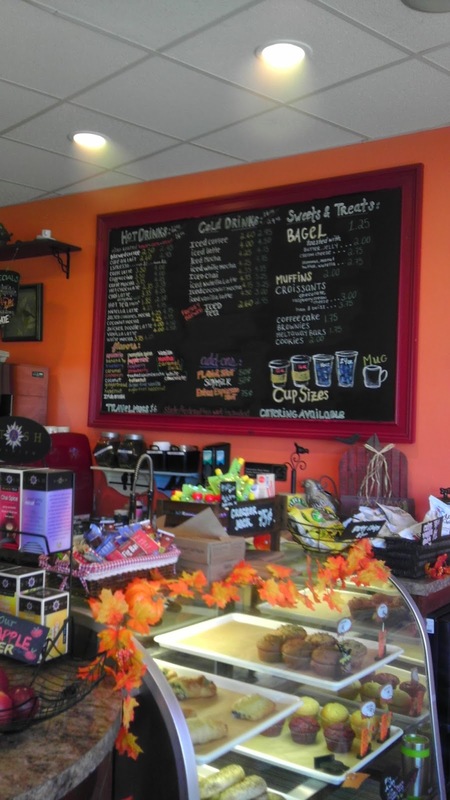 The coffee shop is located on Main Street a couple doors down from The Raven’s Nest. I parked around the corner on Common Street, and as I rounded the corner and saw the cheerful storefront of the coffee shop, I smiled like a fool. It’s what you want in a coffee shop. It has character. The "perch" is a nod to Edgar Allen Poe's The Raven, which inspired the names of the McAuliffe's other businesses. The warm colors of the exterior add cheer to Main Street and drew me in. Once inside, I wanted to stand there and read every item on the menu boards - they were so colorfully appealing. Pumpkin Chai Latte. Iced Caramel Nut Biscotti coffee. And then: Jackie’s Guinness Beef Stew. They serve lunch, too! And what about the coffee? Is the coffee any good? Yes, it is quite good. They get it freshly roasted from Ocean Coffee Roasters in Rhode Island, a family-owned micro-roaster. When I sat down with Maura, right off the bat, I asked if she and her husband had any interest in opening a business in Sharon. They have the know-how, clearly. But no, Maura said maybe in two years when their third and youngest child is in school full day, then maybe they would consider a fourth business. Until then, she is a wealth of information for someone considering a new business venture. In early 2012, a florist down the block went out of business. Maura and Mark pondered opening another business to compliment The Raven’s Nest. The idea of a coffee shop seemed fitting. The landlord gave them a great deal on the rent as they were already tenants a couple doors down. The Coffee Perch opened in August 2012. There’s a full basement downstairs, which is handy for storage, and they have a commercial kitchen at The Raven’s Nest where they can bake up the pastries for The Coffee Perch. We talked about rent, and how the former French Memories space is available for $4800/month. She doesn't see how a coffee shop type business could possibly be successful with that kind of rent. As Sharon residents for nine years, Maura and Mark are feeling the loss of French Memories, too. They used to walk over there for coffee during the hour that their children were in CCD classes on Cottage Street. If they want to go out for a coffee during the class now, they have to drive over to the Starbucks in Cobbs Corner, along with the other parents of kids in the class. It’s barely enough time to wait in line, take a few sips, then it’s time to head back to Sharon. Before we parted, Maura advised me to check out: Center for Women & Enterprise, which offers classes and other resources for women who are starting their own businesses; South Eastern Economic Development Corporation (SEED), which focuses on job creation by financing all types of small businesses in MA and RI; and possible grants. Thanks to Maura for meeting with me for some market research!